Mirtrons were first identified in Drosophila melanogaster and Caenorhabditis elegans and are a type of microRNA that are located in the introns of the mRNA encoding genes. Mirtrons are alternative precursors for microRNA biogenesis. The short hairpin introns use splicing to bypass DROSHA cleavage, which is otherwise essential for the generation of canonical animal microRNAs. Mirtrons arise from the spliced-out introns and are known to function like classical microRNAs (miRs) and regulate gene expression, by either mRNA destabilisation, inhibition of the translation or target mRNA cleavage. Introns are a common source of canonical microRNAs (miRNAs), but new research shows that they can also encode a separate class of miRNA precursors — mirtrons — that are processed by a distinct, Drosha-independent pathway. Animal miRNAs are processed in two stages: first, a hairpin (pre-miRNA) is cleaved from a longer transcript (pri-miRNA) by Drosha; second, this hairpin is exported to the cytoplasm and cleaved into two by Dicer to produce the functional miRNA. The Bartel and Lai laboratories now describe how Drosophila melanogaster introns can be processed initially by the intron pathway before being cleaved by Dicer into functional miRNAs. Bartel and colleagues identified 14 D. melanogaster introns with the sequence and predicted secondary structure of pre-miRNAs but none of the extended structure and sequence of pri-miRNAs. Lai and colleagues detected expression of the processed versions of these introns in various tissues and developmental stages, and both groups then demonstrated that the products of mirtrons could repress reporter constructs. To demonstrate that mirtrons depend on splicing and not Drosha, both groups looked at cis and trans factors. First, they showed that mutation of the nucleotides that are required for splicing abolished production of the mirtrons. Second, they knocked down expression of the lariat debranching enzyme, which resolves spliced introns into a form that can then form hairpins, and found reduced amounts of mirtrons but not of canonical miRNAs. 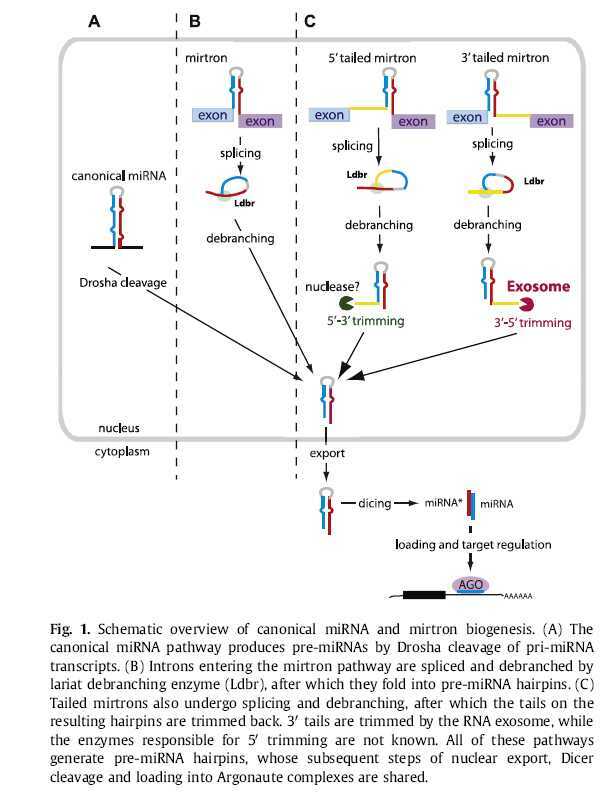 Conversely, knocking down Drosha affected canonical miRNAs but not mirtrons. In contrast to these differences at the first stage of processing, mirtrons and miRNAs depend on similar trans factors at the second stage of processing. Lai and colleagues showed that both depend on Exportin-5 for transfer to the cytoplasm and Argonaute-1 in order to regulate mRNAs, and both groups showed that mirtrons require Dicer for processing the pre-miRNAs into mature products. The prevalence of mirtrons in other species remains to be seen — it might be that they are more common in species such as flies and nematodes, in which average intron length is close to that of a pre-miRNA, than they are in mammals. Indeed, the Bartel laboratory identified several mirtrons in Caenorhabditis elegans. It will also be interesting to better understand their evolutionary dynamics — a proportion of introns might be processed as mirtrons simply because the processing machinery is there. If so, mirtrons would be lost rapidly through selection if they were deleterious, or slowly through genetic drift if they were neutral, and would be retained only if they were beneficial. An important next step will be to catalogue such random or accidental mirtrons as well as the putatively functional ones that have been classified so far. Mirtrons are short hairpin introns recently found in flies and nematodes that provide an alternative source for animal microRNA biogenesis and use the splicing machinery to bypass Drosha cleavage in initial maturation. The presence of mirtrons outside of invertebrates was not previously known. In the October 26 issue of Molecular Cell, Berezikov et al. 2007 expose a number of short mammalian introns as mirtrons. Berezikov E, Chung WJ, Willis J, Cuppen E, Lai EC. Mol Cell. 2007 28(2): 328-336. Mirtrons are alternative precursors for microRNA biogenesis that were recently described in invertebrates. These short hairpin introns use splicing to bypass Drosha cleavage, which is otherwise essential for the generation of canonical animal microRNAs. Using computational and experimental strategies, we now establish that mammals have mirtrons as well. We identified 3 mirtrons that are well conserved and expressed in diverse mammals, 16 primate-specific mirtrons, and 46 candidates supported by limited cloning evidence in primates. As with some fly and worm mirtrons, the existence of well-conserved mammalian mirtrons indicates their relatively ancient incorporation into endogenous regulatory pathways. However, as worms, flies, and mammals each have different sets of mirtrons, we hypothesize that different animals may have independently evolved the capacity for this hybrid small RNA pathway. This notion is supported by our observation of several clade-specific features of mammalian and invertebrate mirtrons. A well-defined mechanism governs the maturation of most microRNAs (miRNAs) in animals, via stepwise cleavage of precursor hairpin transcripts by the Drosha and Dicer RNase III enzymes. Recently, several alternative miRNA biogenesis pathways were elucidated, the most prominent of which substitutes Drosha cleavage with splicing. Such short hairpin introns are known as mirtrons, and their study has uncovered related pathways that combine splicing with other ribonucleolytic machinery to yield Dicer substrates for miRNA biogenesis. In this review, we consider the mechanisms of splicing-mediated miRNA biogenesis, computational strategies for mirtron discovery, and the evolutionary implications of the existence of multiple miRNA biogenesis pathways. Altogether, the features of mirtron pathways illustrate unexpected flexibility in combining RNA processing pathways, and highlight how multiple functions can be encoded by individual transcripts. MicroRNAs (miRNAs) are 22-nucleotide endogenous RNAs that often repress the expression of complementary messenger RNAs1. In animals, miRNAs derive from characteristic hairpins in primary transcripts through two sequential RNase III-mediated cleavages; Drosha cleaves near the base of the stem to liberate a 60-nucleotide pre-miRNA hairpin, then Dicer cleaves near the loop to generate a miRNA:miRNA* duplex2,3. From that duplex, the mature miRNA is incorporated into the silencing complex. Here we identify an alternative pathway for miRNA biogenesis, in which certain debranched introns mimic the structural features of pre-miRNAs to enter the miRNA-processing pathway without Drosha-mediated cleavage. We call these pre-miRNAs/introns ‘mirtrons’, and have identified 14 mirtrons in Drosophila melanogaster and another four in Caenorhabditis elegans (including the reclassification of mir-62). Some of these have been selectively maintained during evolution with patterns of sequence conservation suggesting important regulatory functions in the animal. The abundance of introns comparable in size to pre-miRNAs appears to have created a context favourable for the emergence of mirtrons in flies and nematodes. This suggests that other lineages with many similarly sized introns probably also have mirtrons, and that the mirtron pathway could have provided an early avenue for the emergence of miRNAs before the advent of Drosha. Sibley CR, Seow Y, Saayman S, Dijkstra KK, El Andaloussi S, Weinberg MS, Wood MJ. Department of Physiology, Anatomy and Genetics, University of Oxford, South Parks Road, Oxford, OX1 3QX, UK, Molecular Engineering Laboratory, Science and Engineering Institutes, A*STAR, Singapore and Antiviral Gene Therapy Research Unit, Department of Molecular Medicine and Haematology, University of Witwatersrand, Johannesburg, South Africa. Mirtrons, short hairpin pre-microRNA (miRNA) mimics directly produced by intronic splicing, have recently been identified and experimentally confirmed in invertebrates. While there is evidence to suggest several mammalian miRNAs have mirtron origins, this has yet to be experimentally demonstrated. Here, we characterize the biogenesis of mammalian mirtrons by ectopic expression of splicing-dependent mirtron precursors. The putative mirtrons hsa-miR-877, hsa-miR-1226 and mmu-miR-1224 were designed as introns within eGFP. Correct splicing and function of these sequences as introns was shown through eGFP fluorescence and RT-PCR, while all mirtrons suppressed perfectly complementary luciferase reporter targets to levels similar to that of corresponding independently expressed pre-miRNA controls. Splicing-deficient mutants and disruption of key steps in miRNA biogenesis demonstrated that mirtron-mediated gene knockdown was splicing-dependent, Drosha-independent and had variable dependence on RNAi pathway elements following pre-miRNA formation. The silencing effect of hsa-miR-877 was further demonstrated to be mediated by the generation of short anti-sense RNA species expressed with low abundance. Finally, the mammalian mirtron hsa-miR-877 was shown to reduce mRNA levels of an endogenous transcript containing hsa-miR-877 target sites in neuronal SH-SY5Y cells. This work confirms the mirtron origins of three mammalian miRNAs and suggests that they are a functional class of splicing-dependent miRNAs which are physiologically active. Chung WJ, Agius P, Westholm JO, Chen M, Okamura K, Robine N, Leslie CS, Lai EC. Department of Developmental Biology, Sloan-Kettering Institute, 1017 Rockefeller Research Laboratories, New York, New York 10065, USA. Mirtrons are intronic hairpin substrates of the dicing machinery that generate functional microRNAs. In this study, we describe experimental assays that defined the essential requirements for entry of introns into the mirtron pathway. These data informed a bioinformatic screen that effectively identified functional mirtrons from the Drosophila melanogaster transcriptome. These included 17 known and six confident novel mirtrons among the top 51 candidates, and additional candidates had limited read evidence in available small RNA data. Our computational model also proved effective on Caenorhabditis elegans, for which the identification of 14 cloned mirtrons among the top 22 candidates more than tripled the number of validated mirtrons in this species. A few low-scoring introns generated mirtron-like read patterns from atypical RNA structures, but their paucity suggests that relatively few such loci were not captured by our model. Unexpectedly, we uncovered examples of clustered mirtrons in both fly and worm genomes, including a <8-kb region in C. elegans harboring eight distinct mirtrons. Altogether, we demonstrate that discovery of functional mirtrons, unlike canonical miRNAs, is amenable to computational methods independent of evolutionary constraint. The SVM code and data used in this publication can be downloaded from here (32 MB). Farazi TA, Spitzer JI, Morozov P, Tuschl T.
Howard Hughes Medical Institute, Laboratory of RNA Molecular Biology, Rockefeller University, New York, NY 10065, USA. Mature microRNAs (miRNAs) are single-stranded RNA molecules of 20-23 nucleotide (nt) length that control gene expression in many cellular processes. These molecules typically reduce the stability of mRNAs, including those of genes that mediate processes in tumorigenesis, such as inflammation, cell cycle regulation, stress response, differentiation, apoptosis and invasion. miRNA targeting is mostly achieved through specific base-pairing interactions between the 5' end ('seed' region) of the miRNA and sites within coding and untranslated regions (UTRs) of mRNAs; target sites in the 3' UTR lead to more effective mRNA destabilization. Since miRNAs frequently target hundreds of mRNAs, miRNA regulatory pathways are complex. To provide a critical overview of miRNA dysregulation in cancer, we first discuss the methods currently available for studying the role of miRNAs in cancer and then review miRNA genomic organization, biogenesis and mechanism of target recognition, examining how these processes are altered in tumorigenesis. Given the critical role miRNAs play in tumorigenesis processes and their disease-specific expression, they hold potential as therapeutic targets and novel biomarkers. Okamura K, Hagen JW, Duan H, Tyler DM, Lai EC. Memorial Sloan-Kettering Cancer Center, Department of Developmental Biology, 1275 York Ave, Box 252, New York, NY 10021, USA. The canonical microRNA (miRNA) pathway converts primary hairpin precursor transcripts into approximately 22 nucleotide regulatory RNAs via consecutive cleavages by two RNase III enzymes, Drosha and Dicer. In this study, we characterize Drosophila small RNAs that derive from short intronic hairpins termed "mirtrons." Their nuclear biogenesis appears to bypass Drosha cleavage, which is essential for miRNA biogenesis. Instead, mirtron hairpins are defined by the action of the splicing machinery and lariat-debranching enzyme, which yield pre-miRNA-like hairpins. The mirtron pathway merges with the canonical miRNA pathway during hairpin export by Exportin-5, and both types of hairpins are subsequently processed by Dicer-1/loqs. This generates small RNAs that can repress perfectly matched and seed-matched targets, and we provide evidence that they function, at least in part, via the RNA-induced silencing complex effector Ago1. These findings reveal that mirtrons are an alternate source of miRNA-type regulatory RNAs. Flynt AS, Greimann JC, Chung WJ, Lima CD, Lai EC. Developmental Biology Program, Sloan-Kettering Institute, 1275 York Avenue, Box 252, New York, NY 10065, USA. microRNAs (miRNAs) are approximately 22 nucleotide regulatory RNAs derived from hairpins generated either by Drosha cleavage (canonical substrates) or by splicing and debranching of short introns (mirtrons). The 5' end of the highly conserved Drosophila mirtron-like locus mir-1017 is coincident with the splice donor, but a substantial "tail" separates its hairpin from the 3'splice acceptor. Genetic and biochemical studies define a biogenesis pathway involving splicing, lariat debranching, and RNA exosome-mediated "trimming," followed by conventional dicing and loading into AGO1 to yield a miRNA that can repress seed-matched targets. Analysis of cloned small RNAs yielded six additional candidate 3' tailed mirtrons in D. melanogaster. Altogether, these data reveal an unexpected role for the exosome in the biogenesis of miRNAs from hybrid mirtron substrates. Martin R, Smibert P, Yalcin A, Tyler DM, Schäfer U, Tuschl T, Lai EC. Department of Developmental Biology, 1017 Rockefeller Research Laboratories, Sloan-Kettering Institute, New York, New York 10065, USA. Canonical primary microRNA (miRNA) transcripts and mirtrons are proposed to transit distinct nuclear pathways en route to generating mature approximately 22 nucleotide regulatory RNAs. We generated a null allele of Drosophila pasha, which encodes a double-stranded RNA-binding protein partner of the RNase III enzyme Drosha. Analysis of this mutant yielded stringent evidence that Pasha is essential for the biogenesis of canonical miRNAs but is dispensable for the processing and function of mirtron-derived regulatory RNAs. The pasha mutant also provided a unique tool to study the developmental requirements for Drosophila miRNAs. While pasha adult somatic clones are similar in many respects to those of dicer-1 clones, pasha mutant larvae revealed an unexpected requirement for the miRNA pathway in imaginal disc growth. These data suggest limitations to somatic clonal analysis of miRNA pathway components. Glazov EA, Kongsuwan K, Assavalapsakul W, Horwood PF, Mitter N, Mahony TJ. PLoS One. 2009 4(7): e6349. MicroRNA (miRNA) and other types of small regulatory RNAs play a crucial role in the regulation of gene expression in eukaryotes. Several distinct classes of small regulatory RNAs have been discovered in recent years. To extend the repertoire of small RNAs characterized in mammals and to examine relationship between host miRNA expression and viral infection we used Illumina's ultrahigh throughput sequencing approach. We sequenced three small RNA libraries prepared from cell line derived from the adult bovine kidney under normal conditions and upon infection of the cell line with Bovine herpesvirus 1. We used a bioinformatics approach to distinguish authentic mature miRNA sequences from other classes of small RNAs and short RNA fragments represented in the sequencing data. Using this approach we detected 219 out of 356 known bovine miRNAs and 115 respective miRNA* sequences. In addition we identified five new bovine orthologs of known mammalian miRNAs and discovered 268 new cow miRNAs many of which are not identifiable in other mammalian genomes and thus might be specific to the ruminant lineage. In addition we found seven new bovine mirtron candidates. We also discovered 10 small nucleolar RNA (snoRNA) loci that give rise to small RNA with possible miRNA-like function. Results presented in this study extend our knowledge of the biology and evolution of small regulatory RNAs in mammals and illuminate mechanisms of small RNA biogenesis and function. New miRNA sequences and the original sequencing data have been submitted to miRNA repository (miRBase) and NCBI GEO archive respectively. We envisage that these resources will facilitate functional annotation of the bovine genome and promote further functional and comparative genomics studies of small regulatory RNA in mammals. Shapiro JS, Varble A, Pham AM, Tenoever BR. Microbiology Graduate School Training Program, Mount Sinai School of Medicine, New York, New York 10029, USA. Cellular utilization of RNA interference (RNAi) as a mechanism to combat virus infection is thought to be restricted to plants and invertebrates. In vertebrates, antiviral defenses are largely dependent on interferons (IFNs), with the use of small RNAs restricted to microRNA (miRNA)-mediated targeting of host transcripts. Here we demonstrate that incorporation of a primary miRNA into a cytoplasmic virus results in the formation of a Dicer-dependent, DGCR8-independent, mature miRNA capable of conferring RNAi-like activity. Processing of the viral mirtron-like product (virtron) is indistinguishable from endogenous miRNA maturation and elicits post-transcriptional gene silencing, albeit at a reduced level. Furthermore, virtrons impose Dicer-dependent, microprocessor-independent, and IFN-independent interference on virus replication in a sequence-specific manner. Taken together, these results suggest the existence of a noncanonical, small-RNA-based activity capable of processing cytoplasmic hairpins and perhaps contributing to the cell's antiviral arsenal. Brown JW, Marshall DF, Echeverria M.
The gene organization of small nucleolar RNAs (snoRNAs) and microRNAs (miRNAs) varies within and among different organisms. This diversity is reflected in the maturation pathways of these small noncoding RNAs (ncRNAs). The presence of noncoding RNAs in introns has implications for the biogenesis of both mature small RNAs and host mRNA. The balance of the interactions between the processing or ribonucleoprotein assembly of intronic noncoding RNAs and the splicing process can regulate the levels of ncRNA and host mRNA. The processing of snoRNAs - both intronic and non-intronic - is well characterised in yeast, plants and animals and provides a basis for examining how intronic plant miRNAs are processed. Zhu QH, Spriggs A, Matthew L, Fan L, Kennedy G, Gubler F, Helliwell C.
CSIRO Plant Industry, Canberra, ACT 2601, Australia. Endogenous small RNAs, including microRNAs (miRNAs) and short-interfering RNAs (siRNAs), function as post-transcriptional or transcriptional regulators in plants. miRNA function is essential for normal plant development and therefore is likely to be important in the growth of the rice grain. To investigate the roles of miRNAs in rice grain development, we carried out deep sequencing of the small RNA populations of rice grains at two developmental stages. In a data set of approximately 5.5 million sequences, we found representatives of all 20 conserved plant miRNA families. We used an approach based on the presence of miRNA and miRNA* sequences to identify 39 novel, nonconserved rice miRNA families expressed in grains. Cleavage of predicted target mRNAs was confirmed for a number of the new miRNAs. We identified a putative mirtron, indicating that plants may also use spliced introns as a source of miRNAs. We also identified a miRNA-like long hairpin that generates phased 21 nt small RNAs, strongly expressed in developing grains, and show that these small RNAs act in trans to cleave target mRNAs. Comparison of the population of miRNAs and miRNA-like siRNAs in grains to those in other parts of the rice plant reveals that many are expressed in an organ-specific manner. A new catalog of microRNA (miRNA) species called mirtrons has been discovered in animals recently, which originate from spliced introns of the gene transcripts. However, only one putative mirtron, osa-MIR1429, has been identified in rice (Oryza sativa). We employed a high-throughput sequencing (HTS) data- and structure-based approach to do a genome-wide search for the mirtron candidate in both Arabidopsis (Arabidopsis thaliana) and rice. Five and eighteen candidates were discovered in the two plants respectively. To investigate their biological roles, the targets of these mirtrons were predicted and validated based on degradome sequencing data. The result indicates that the mirtrons could guide target cleavages to exert their regulatory roles post-transcriptionally, which needs further experimental validation. Patanun O, Lertpanyasampatha M, Sojikul P, Viboonjun U, Narangajavana J. Department of Biotechnology, Faculty of Science, Mahidol University, Rama VI Road, Bangkok, 10400, Thailand. Mol Biotechnol. 2012 Mar 3. MicroRNAs (miRNAs) are a newly discovered class of noncoding endogenous small RNAs involved in plant growth and development as well as response to environmental stresses. miRNAs have been extensively studied in various plant species, however, only few information are available in cassava, which serves as one of the staple food crops, a biofuel crop, animal feed and industrial raw materials. In this study, the 169 potential cassava miRNAs belonging to 34 miRNA families were identified by computational approach. Interestingly, mes-miR319b was represented as the first putative mirtron demonstrated in cassava. A total of 15 miRNA clusters involving 7 miRNA families, and 12 pairs of sense and antisense strand cassava miRNAs belonging to six different miRNA families were discovered. Prediction of potential miRNA target genes revealed their functions involved in various important plant biological processes. The cis-regulatory elements relevant to drought stress and plant hormone response were identified in the promoter regions of those miRNA genes. The results provided a foundation for further investigation of the functional role of known transcription factors in the regulation of cassava miRNAs. The better understandings of the complexity of miRNA-mediated genes network in cassava would unravel cassava complex biology in storage root development and in coping with environmental stresses, thus providing more insights for future exploitation in cassava improvement. Department of Developmental Biology, Sloan-Kettering Institute, 1275 York Ave, Box 252, NY 10065, USA. Curtis HJ, Sibley CR, Wood MJ. Post-transcriptional gene silencing (PTGS) via RNA interference (RNAi) is a vital gene regulatory mechanism for fine-tuning gene expression. RNAi effectors termed microRNAs (miRNAs) are implicated in various aspects of animal development and normal physiological function, while dysregulation has been linked to several pathologies. Several atypical miRNA biogenesis pathways have been identified, yet in most cases the reasons for their emergence remain unclear. One of these atypical pathways is the mirtron pathway, where short introns are excised by splicing to generate intermediates of the RNAi pathway, with no cleavage by the microprocessor. Closely related pathways involving tailed-mirtron and simtron biogenesis have also been described. There is extensive evidence that mirtrons function as miRNAs, and while some are evolutionarily conserved across similar species, others appear to have emerged relatively recently. In addition, through exploitation of the potent and sequence-specific silencing capabilities o RNAi, synthetic mirtrons may have potential for overcoming certain therapeutic challenges. Joshi PK, Gupta D, Nandal UK, Khan Y, Mukherjee SK, Sanan-Mishra N.
Plant Molecular Biology Group, International Center for Genetic Engineering and Biotechnology, Aruna Asaf Ali Marg, New Delhi, India. Discovery of hundreds of mirtrons in mouse and human small RNA data. Ladewig E, Okamura K, Flynt AS, Westholm JO, Lai EC. Department of Developmental Biology, Sloan-Kettering Institute, New York, New York 10065, USA. Atypical miRNA substrates do not fit criteria often used to annotate canonical miRNAs, and can escape the notice of miRNA genefinders. Recent analyses expanded the catalogs of invertebrate splicing-derived miRNAs ("mirtrons"), but only a few tens of mammalian mirtrons have been recognized to date. We performed meta-analysis of 737 mouse and human small RNA data sets comprising 2.83 billion raw reads. Using strict and conservative criteria, we provide confident annotation for 237 mouse and 240 human splicing-derived miRNAs, the vast majority of which are novel genes. These comprise three classes of splicing-derived miRNAs in mammals: conventional mirtrons, 5'-tailed mirtrons, and 3'-tailed mirtrons. In addition, we segregated several hundred additional human and mouse loci with candidate (and often compelling) evidence. Most of these loci arose relatively recently in their respective lineages. Nevertheless, some members in each of the three mirtron classes are conserved, indicating their incorporation into beneficial regulatory networks. We also provide the first Northern validation for mammalian mirtrons, and demonstrate Dicer-dependent association of mature miRNAs from all three classes of mirtrons with Ago2. The recognition of hundreds of mammalian mirtrons provides a new foundation for understanding the scope and evolutionary dynamics of Dicer substrates in mammals. Biogenesis of mammalian microRNAs by a non-canonical processing pathway. Havens MA, Reich AA, Duelli DM, Hastings ML. Department of Cell Biology and Anatomy, Chicago Medical School, Rosalind Franklin University of Medicine and Science, North Chicago, IL 60064, USA. Canonical microRNA biogenesis requires the Microprocessor components, Drosha and DGCR8, to generate precursor-miRNA, and Dicer to form mature miRNA. The Microprocessor is not required for processing of some miRNAs, including mirtrons, in which spliceosome-excised introns are direct Dicer substrates. In this study, we examine the processing of putative human mirtrons and demonstrate that although some are splicing-dependent, as expected, the predicted mirtrons, miR-1225 and miR-1228, are produced in the absence of splicing. 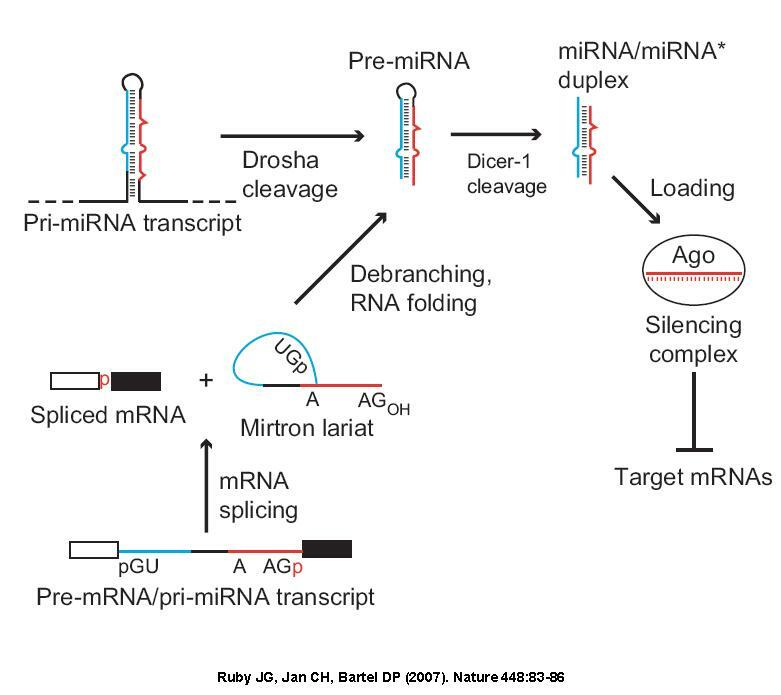 Remarkably, knockout cell lines and knockdown experiments demonstrated that biogenesis of these splicing-independent mirtron-like miRNAs, termed 'simtrons', does not require the canonical miRNA biogenesis components, DGCR8, Dicer, Exportin-5 or Argonaute 2. However, simtron biogenesis was reduced by expression of a dominant negative form of Drosha. Simtrons are bound by Drosha and processed in vitro in a Drosha-dependent manner. Both simtrons and mirtrons function in silencing of target transcripts and are found in the RISC complex as demonstrated by their interaction with Argonaute proteins. These findings reveal a non-canonical miRNA biogenesis pathway that can produce functional regulatory RNAs. Yao J, Wang Y, Wang W, Wang N, Li H.
Department of Animal Science and Technology, Northeast Agricultural University, No. 59 Mucai Street, Xiangfang District, Harbin, Heilongjiang, 150030, PR China. MicroRNAs (miRNAs) are small non-coding RNAs that play important roles in a variety of biological processes. Studies of miRNAs in mammals suggest that many are involved in lipid metabolism and adipocyte differentiation, but little is known about miRNA expression profiles during chicken adipogenesis. In this study, the Solexa sequencing approach was used to sequence a small RNA library prepared from Arbor Acres broiler pre-adipocytes, and more than 106 short sequence reads were obtained. From these, 159 known chicken miRNAs and 63 novel miRNAs were identified using a bioinformatics approach. Fifty-nine of these miRNA genes were further organized into 27 compact miRNA genomic clusters, and 34 new chicken mirtrons were also discovered, among which there were 27 mirtron candidates. These findings should serve as a foundation for future research on the functional roles of miRNAs in chicken adipocyte differentiation.